July brings two red-white-and-blue National days: 4th of July is when we all wish Happy Independence Day to the United States of America and le 14 Juillet it’s time to sing Joyeuse Anniversaire to France! Busy National month, huh? How about our nails, then? We’ll have a lot of parties to attend to, right? 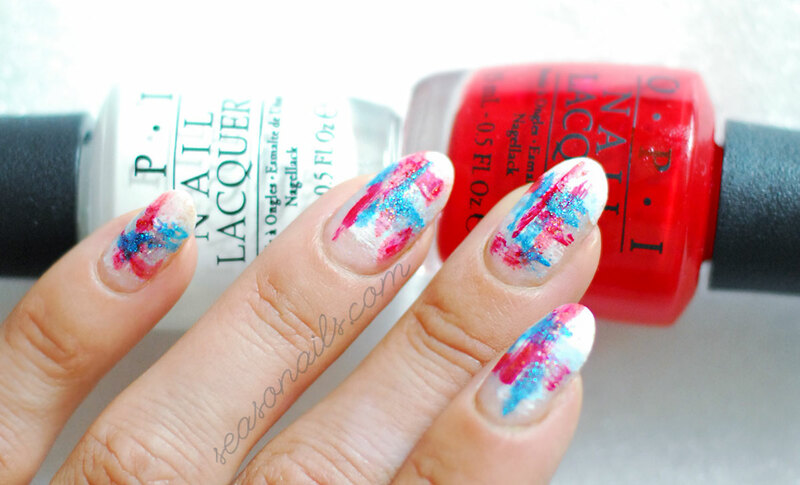 So I thought just one manicure isn’t enough – today I bring you two Red White and Blue nail art ideas! 4th of July nails, here we come! On a sparkly base of Diamond Dazzle (Milani) I used the dry brush technique (you’ve seen me use it here before, for the abstract zebra nails) to paint each nail with red, white and blue! It’s important to start with the white and cover the tips like a French nail art. 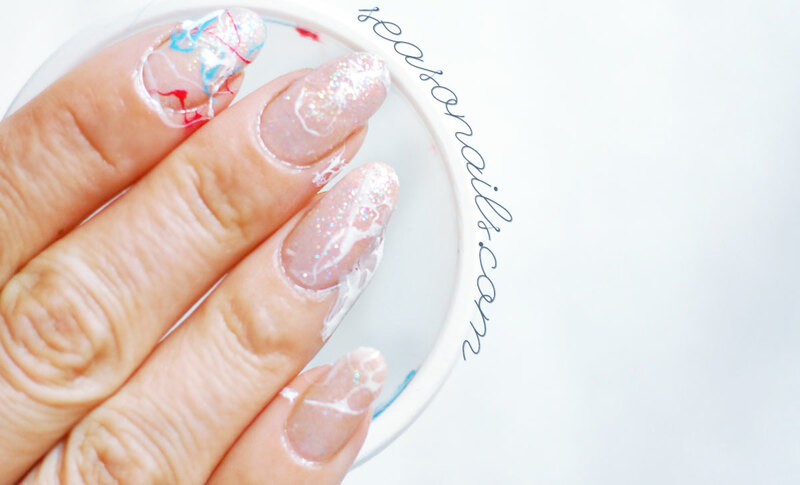 This is mainly because my nails are long and the free tips are usually transparent – I don’t want that transparency in my current nail art, so I’m covering it with white. See also: Dry brush technique for Asian nails! I’m adding some touches of see-through blue (China Glaze Isle See You Later) and bright red (OPI Red Hot Rio). Horizontal and vertical, thin or wide, it’s essential that your nail polish would leave behind that specific dry brush stroke. I added sparkly touches of Zoya Liberty – for what is an Independence Day manicure without ‘Liberty’ in it? 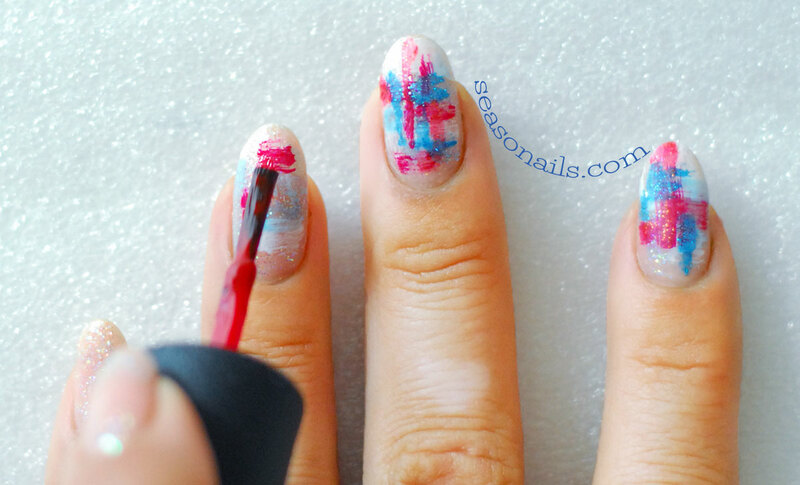 For the finish, I went for a matte topcoat to accentuate the artistic feel of my abstract 4th of July nails! (or 14 Juillet ongles). See also: Zoya Liberty perfect for Inside Out nails! 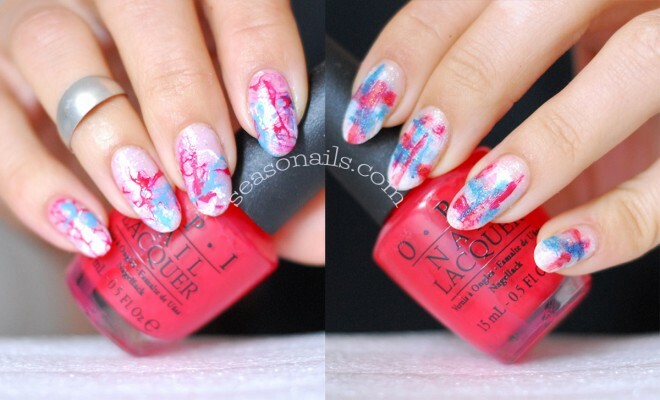 The second red-white-and-blue nails idea is made using a technique you’ve seen when I did my precious gemstones nails! Except these are my precious fireworks nails! 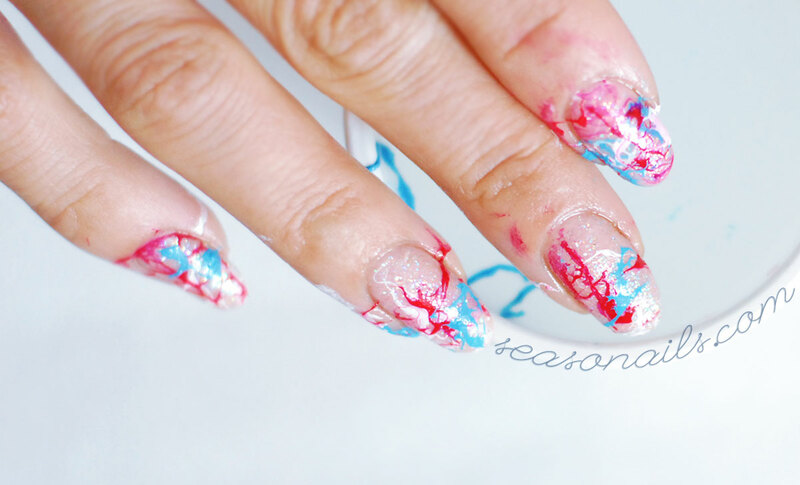 Messy but gorgeous and smelling heavenly (remember I use perfume to spread the polish at the surface of the water), the red-white-and-blue splatter nails are so fun to do, I can’t wait to find another opportunity to use this technique! 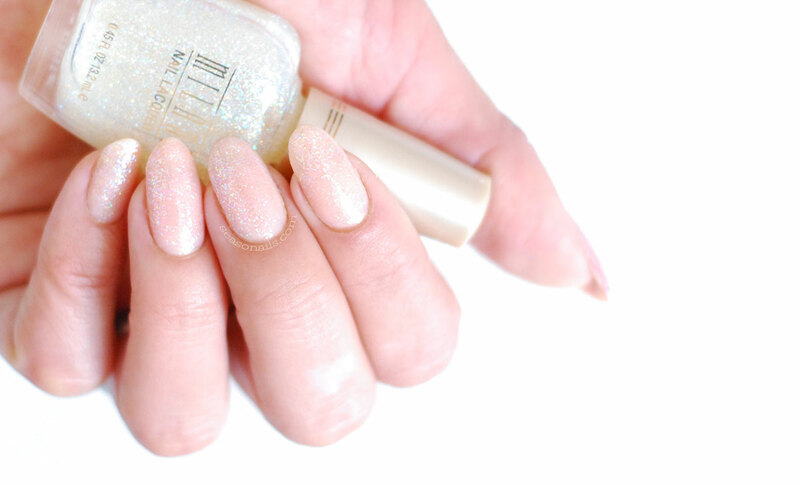 I built my nail art on the same Diamond Dazzle Milani glitter polish and started with the white (OPI Alpine Snow) – two or three drops on the surface and then a spray of your favorite perfume to spread the polish. I dipped all fingers at once because I wasn’t aiming for a specific design – like watermarble usually forces you – to make one nail at the time. This time I was counting on the hectic dispersion of nail polish to dip all my nails at once. Next was red (OPI Red Hot Rio) and I dipped my nails two by two to ensure that there was enough polish on the nail (this is a nail art that could very well be used for Christmas and Halloween as well). 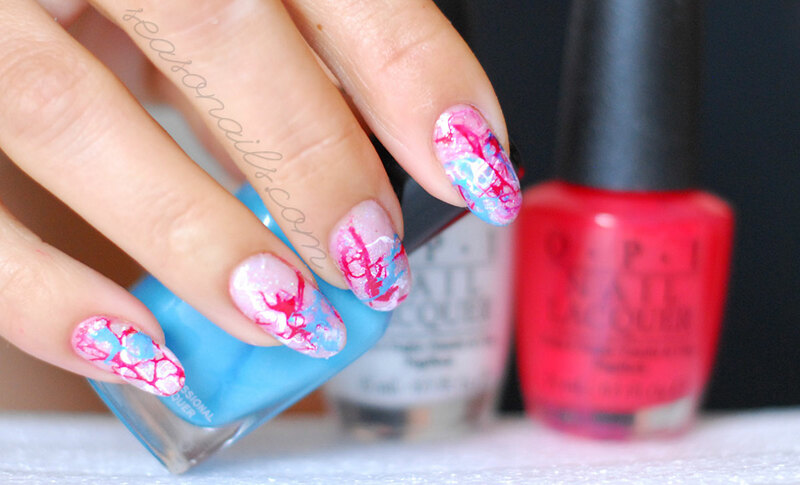 Last is the blue (Zoya Robyn) to finish my 4th of July nails splatter fun! 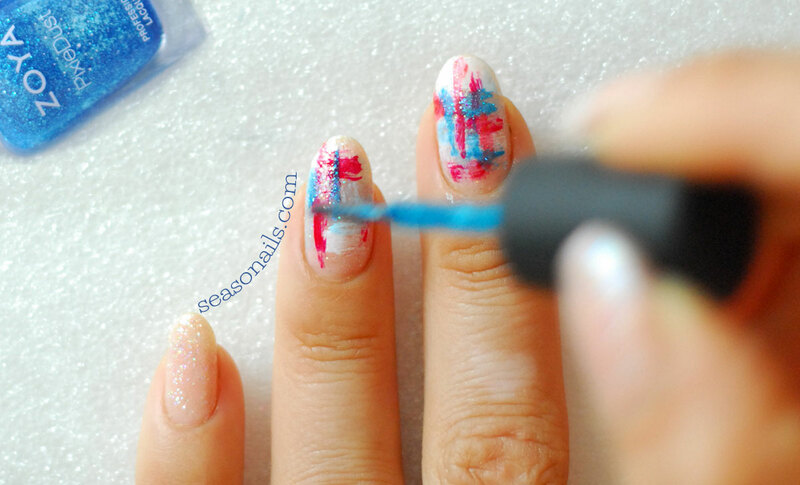 I covered all with OPI’s Rapi Dry topcoat and enjoyed the photo session – whichever nail art you choose for the 4th of July or 14 Juillet, I hope you have just as much fun as I did painting my nails and partying!